Yes, Americans are supposed to remember it. We’re supposed to remember it as a bastion of freedom, a quintessential symbol of independence. Established in 1718, the Mission San Antonio de Valero (the Alamo’s proper name) is the most visited site in Texas today, even though the encroaching city has devoured large parts of it, so plenty of people are still recalling it. After their visit, however, they may want to forget it. Despite the eerie effectiveness of the long barrack, the site of the last minutes of intense hand-to-hand combat where you can walk in the steps of those engaged in the close-contact fighting and gruesome bloodshed, they may simply remember the Alamo as a tacky tourist site. 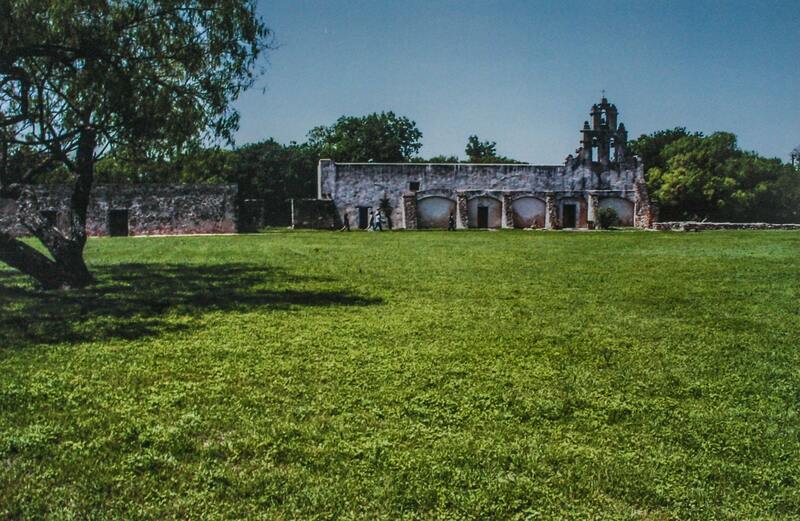 Mission Concepcíon looks the same today as it did 250 years ago. The overtly flag-waving orientation film, a testimonial to the bravery of the 189 defenders (including Davy Crockett and Jim Bowie) against 2,000 Mexicans in 1836, strikes a sour note of jingoism. To take nothing away from the courage of those fighters, who battled in the face of impossible odds, the highly patriotic film seems lopsided and neglects to include the United States’ questionable actions that ultimately caused this place to be inserted in the collective American memory. Not that the Mexicans were pure, either — General Santa Anna was hardly an angel. The iconic church building —the main draw of the Alamo, hailed as a national shrine — bears entrance signs ordering quiet, hats removed, and no photography. I eagerly stepped inside this sacrosanct place and found that it has been turned into an enormous gift shop, complete with a fudge counter and hordes of tourists disobeying the signs of etiquette. More than a little horrified, I quickly exited the church and looked directly across the street at the wax museum, the Guinness World Records Museum, and the cheesy haunted house attraction. I was pretty sure that if those 189 defenders would have known what the Alamo would become today, they probably wouldn’t have bothered. That semi-negative experience corrected itself when I started my drive on the Mission Trail to check out four other missions in San Antonio that are all part of the National Park Service. The 12-mile drive provides easy access to these self-contained communities that the Spanish set up to convert Native Americans to Catholicism and that produced everything they needed to survive. The first one — Mission Concepcíon (officially, Mission Nuestra Señora de la Purísima Concepcíon de Acuña), founded by Franciscan friars — was the antithesis of the Alamo. Except for a few birds and some trees and patchy grass, I was the only living creature there. A barrel-ceiling loggia leads to the twin towers and portal of the church. Dedicated in 1755, it remains the oldest unrestored stone Catholic church in the United States and stands almost exactly as it did more than two centuries ago. Although the colorful geometric designs that once adorned the exterior have long faded, the interior of the church — a simple, contemplative place — has been revitalized and is once again being used for Sunday Masses. This, I thought, is what the Alamo should have been, perhaps with a few more people. The name of Mission San José’s Rose Window has led to centuries of speculation. With its acres of fields once cultivated for agriculture and for livestock herds, the next mission, Mission San José, is the largest of the four. Once the social and cultural community for more than 300 Native Americans, complete with its own granary and gristmill, which still remain, this mission features an arched walkway leading to a church built in 1782 with an elaborately carved portal. Statues on the façade include those of the mission’s namesake, San José (St. Joseph), as well as saints Anne, Dominic, Francis, and Joachim, and Our Lady of Guadalupe. 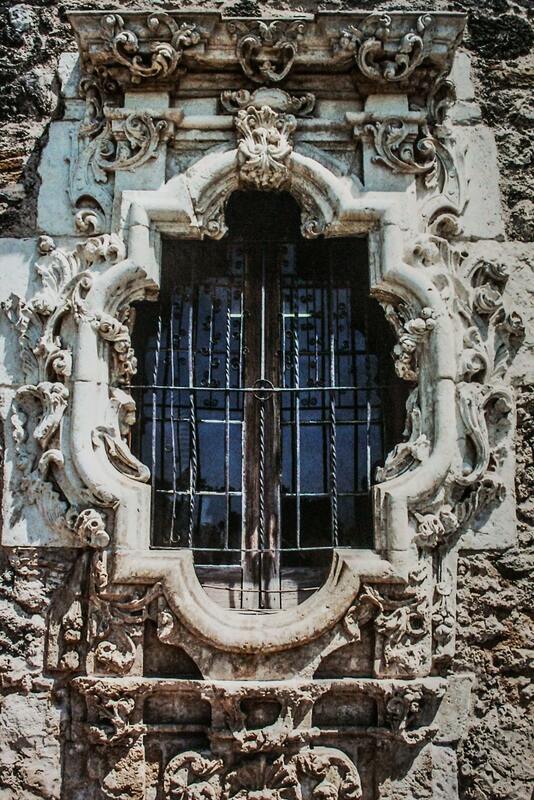 On the side, I admired the Rose Window, a wonderful example of Spanish Colonial ornamentation. It’s not a typical rose window, though; for starters, it’s not round, and the glass is plain. The highly ornamented work around it, however, is outstanding. Legend holds that its name is really Rosa’s Window, a reference to the sculptor’s sweetheart, Rosa, who was lost at sea on her way from Spain to join him in Texas. More likely, though, it was named after Saint Rose of Lima, the first saint of the New World. Mission San Juan Capistrano’s abundant agricultural output made it a regional supplier. Seemingly insurmountable problems plagued the third mission, Mission San Juan Capistrano: epidemics of smallpox and measles that wreaked havoc on the Native Americans within the compound; raids by other Native Americans; and political vagaries outside the perimeter walls that swayed the ebb and flow of support for the mission. Nevertheless, the mission prospered. The existing church was completed in 1756, and by 1762 more than 200 Native Americans were residing at the mission, working in the granary, the forge, and the textile and carpentry shops. They also raised crops, including peaches, melons, pumpkins, beans, and sugar cane. About 3,500 sheep and just as many cattle added to the mission’s self-sufficiency. Often with an agricultural surplus, it became a leading supplier not only to the nearby garrisons and markets but to a vast trading network that stretched from Mexico to Louisiana. Ultimately, a declining population led to the end for the mission, and the new church that was being constructed remains to this day a partially built ruin. The old church, however, is still used for services and has been an active local parish since 1909. 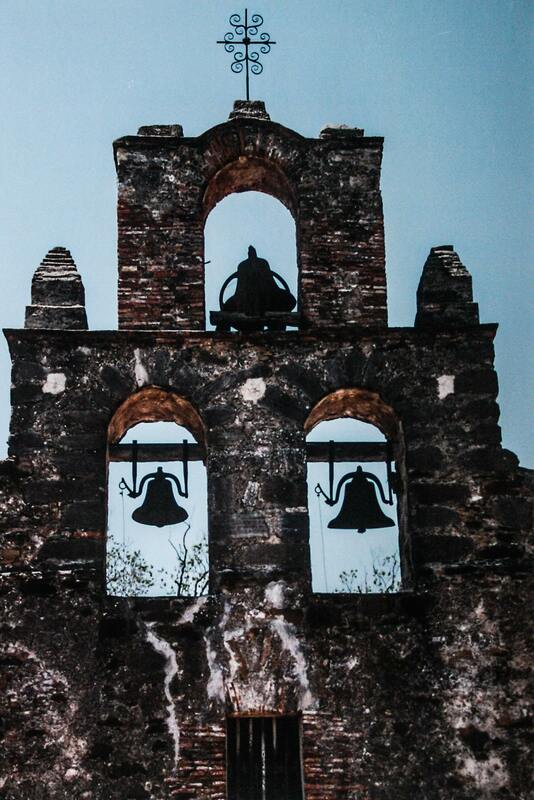 Bells started ringing at Mission San Francisco de la Espada in 1756. I saved the oldest of the four for last. 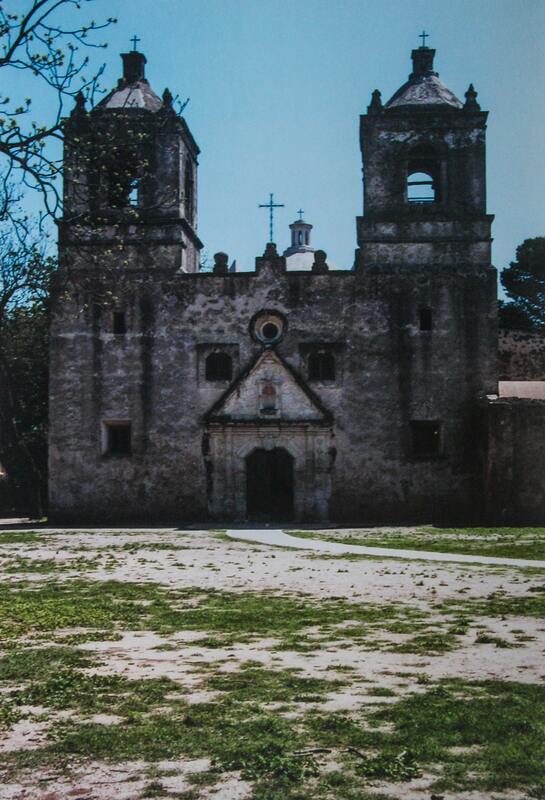 Mission San Francisco de la Espada, with its friary (1745) and church with three iron bells (1756), was the first established mission in what is now Texas. The missionaries taught the resident Native Americans carpentry, masonry, stonecutting, blacksmithing and weaving, all of which made Mission Espada an elaborately built place. Part of the irrigation system that brought water from the San Antonio River to the mission’s agricultural fields is still in use today, the only such system functioning in its original form from the Spanish colonial period in the United States. Epidemics, raids, and a fire in 1826 ultimately led to the closure of the mission a few years later. In 1858, however, a French priest arrived on the scene, made the mission his home, and was largely responsible for saving what was left of the mission for visitors like me to enjoy today. All of the missions are different, but they share similar features — the protective outer wall, the church, the long houses, the open central area used for farming and livestock, and a serenity that belies the bustling activity that once prevailed here. Should you find yourself in San Antonio and a little put off by what the Alamo has devolved into, make sure to drive (or bike) out to these other missions for a much more rewarding experience.